For Better Leaf Management, ‘Leaf’ Them Be! Bagging fallen leaves seems just as synonymous with autumn as apple picking and football. But those tree leaves are actually a valuable natural resource that can be a free source of organic matter and nutrients for your lawn. They contain 50 to 80 percent of the nutrients a plant extracts from the soil and air during the season. So instead of burning or bagging those precious nutrients, which take up valuable room in a landfill, use them to keep your lawn and garden healthier. For better leaf management, ‘leaf’ them be! Instead of raking, just mow your leaves with the grass to nourish it naturally. Just mow them with the grass. 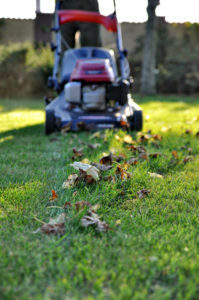 When you have just a few leaves, use a mulching mower to shred them in place, where they can nourish the grass. Use larger amounts of the leaf mulch in vegetable gardens, flower beds and around shrubs or trees. Leaf mulch reduces evaporation from the soil surface, inhibits weed growth, moderates soil temperatures, keeps soils from eroding and crusting and prevents soil compaction. As the mulch decomposes, the nutrients are released into the soil. Aim for a leaf layer which is a couple inches thick. Improve the soil. Use your mower’s bagging attachment to collect the leaves, then work them into garden and flower bed soils. Tilling a six-to-eight-inch layer of leaves into heavy, clay soil will improve aeration and drainage. When the same amount is tilled into lighter soil, the leaves will improve water and nutrient-holding capacity. Doing this now will give the leaves enough time to decompose prior to spring planting. Leaves make great compost! Add your leaves to your compost pile to create your own nutrient-rich fertilizer. Leaves make great compost. Add fallen leaves to other yard waste such as grass clippings, pine needles, weeds and prunings to make compost. For every six to eight inches of leaves, add an inch of other organic waste or rich garden soil, and then add about an inch of manure or one cup of nitrogen-rich fertilizer for each 20 to 25 square feet of surface area. Recycling tree leaves is environmentally friendly, and may even save you a little money on fertilizer and herbicides.